Another knitted necklace this time done with multicolored stone chips and bronze-colored wire. There are chip of purple, green, light blue, tea, red and yellow. 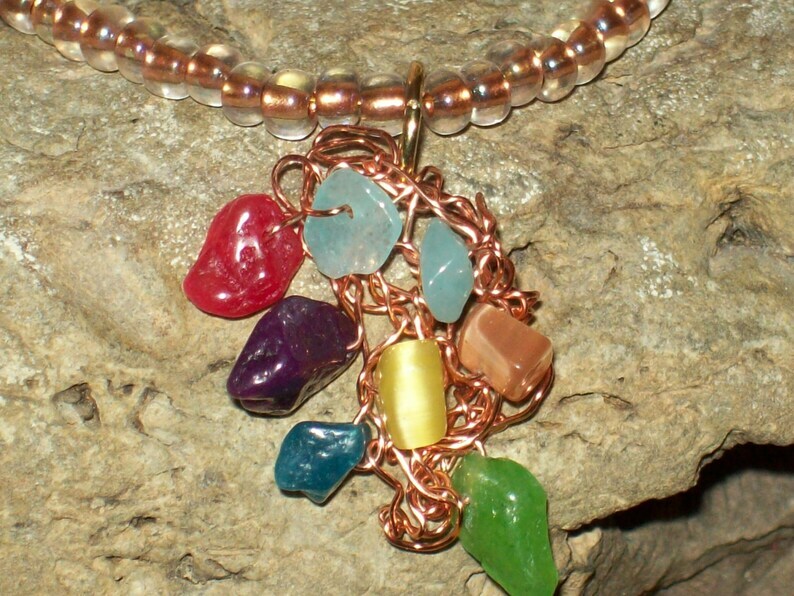 The pendant hangs on a necklace made of seed beads that have a bit of a bronze metallic color as their lining. The pendant is about 1' in length. The necklace is 20" from end to end. This includes 2' of a gold extension chain on both sides. The end of one side of the chain 5 stone chips at the end to give it a finished look. This is truly a one-of-a-kind piece that people will comment on especially when they are told that it was handknitted! When purchased, this necklace will be shipped in a padded envelope.